Southern Blotting is a procedure used for identifying specific sequences of DNA in molecular biology. Southern blotting is a part of blotting technique in molecular biology which is a technique for the transfer of electrophoresed samples of DNA, RNA and proteins onto a suitable carrier such as nylon or nitrocellulose membrane and polyvinylidene difluoride (PVDF) membrane and subsequent fragment detection by probe hybridization. Globally increasing R&D activities in the field of genetics is expected to be the key growth driver for southern blotting during the period of study. Geographically North America holds the largest share in the global southern blotting market due to dramatic rise in HIV-1 prevalence, increasing production of genetically modified crops, rising government funding, and increase spending in research and development procedures. 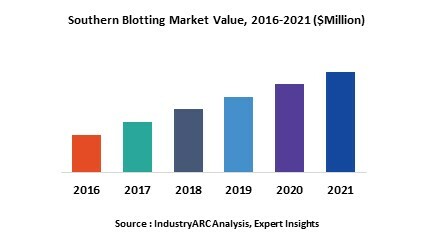 North America was followed by Europe and Asia-Pacific as second and third largest market for southern blotting market. Asia Pacific is projected to have fastest growth, owing to rapidly developing medical infrastructure, increasing medical tourism, increased spending, and increasing awareness amongst population in developing nations such as China, and India in this region. This report identifies the global southern blotting market size in for the year 2014-2016, and forecast of the same for year 2021. It also highlights the market drivers, restraints, growth indicators, challenges, and other key aspects with respect to global southern blotting market. 11.8. Pall Life Science Laboratories.